Terrain launches a Total Turf Aeration System of discovery and choice for Turf Managers. A series of one-metre deep soil core samples will determine the underlying soil structure and pin point the reasons and the depth at which compaction and drainage problems occur. Armed with this knowledge greenkeepers and groundsmen can then decide whether the Deep Drill, aerating down to 10 inches or an Airforce Terralift machine, de-compacting to a depth of one metre will best serve their purpose. The Deep Drill physically removes ten inches of soil to the surface with 60 tungsten tipped drills on the drill bed, located at five inch spacings. The removed soil can be drag matted (as a top dressing) or removed and re-cycled. The treatment encourages root growth and a healthy sward which in turn saves the turf manager money on fertiliser and pesticides. Airforce Terralift machines break up compaction panning to a depth of one metre by injecting compressed air from 10 to 20 bar with minimal disruption to the surface. The process dispels anaerobic conditions and black layer, promotes gaseous exchange and opens the soil to allow natural drainage or water filtration to existing drainage systems. Both treatments are suitable for fine and amenity turf. 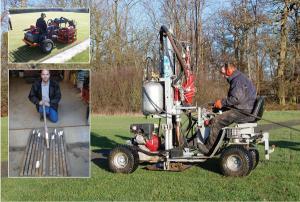 As ever, Terrain Aeration offers a 15% discount for all orders taken at the show.